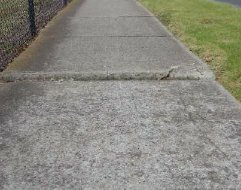 A vertical footpath joint displacement is a footpath defect that occurs when two footpath panels move vertically in relation to each other. This defect presents as a tiny step in a footpath, and is a potential tripping hazard. It may be possible to reduce the prevelance of vertical footpath joint displacements by the installation of Tripstop joints at the time of construction. Application of Premix to the joint.